This is a story of a rare event that occurred in late 1960’s in Kandahar as remembered by elders in the community. A Muslim lady who worked in a Afghan Hindu family’s house claimed that the house lady who was recently married has read the “Kalima” hence she has converted to Islam. The Afghan Hindu lady rejected the claim. The Muslim youth on the street got excited and attacked some of the Hindu properties demanding the lady be given to them. The community got afraid, closed down their businesses and did not come out of their houses for more than a week especially the houses which were on the outskirts of the main town. The lady insisted she has no desire to convert and was put in jail. She was ready to die but not convert. She stayed in jail for 40 days; she actually gave birth to her first child in prison. She is a proud Afghan Hindu living overseas right now. Some families got too scared and left Kandahar for good after this event. If you have witness the event or can interview your elders regarding it, please post your findings. The Sikhs call India their ancestral homeland as their ancestors settled in Afghanistan. The recent beheading of Sikhs in Pakistan, purpotedly by the Taliban is a reminder of the tenuous lives that the depleting community of Sikhs on either side of the Pakistan-Afghan border face today. Two Sikh men were believed to have been beheaded by the Taliban in the FATA region of Pakistan and their heads sent to a gurudwara in Peshawar even as unconfirmed reports suggest that others were being held hostage. Last year, Pak Taliban militants had taken over shops and homes of local Sikh families in the Orakzai Agency against demands of a ransom. This attack is believed to be connected to repeated threats to the Sikh community to convert if they wanted to stay on. The Sikhs have a long history of living in this region. They call India their ancestral homeland as their ancestors settled in Afghanistan over different phases of its history and in the early nineteenth century when Afghans lost Peshawar to the Sikhs. Besides, over the last few centuries descendants of Sikh traders on the route passing through Afghanistan – starting in Sindh and Punjab through Kandahar, Jalalabad and Kabul – eventually settled here. These trade routes then went across the Hindu Kush to Samarkand, Merv and onwards into Europe. A later flood of migration occurred during the partition of India when many Sikh families living in Pakistan, near the Afghan border, found a safer and faster refuge into Afghanistan rather than moving across the country to come into India. That is when another generation of this minority from Afghanistan made the country their home. These groups of Sikhs are referred to as the Afghan Sikhs and looked upon as a small albeit critical component of the ethnically diverse fabric of Afghanistan. Like most Afghans, against the background of the ceaseless three decade long conflict, this minority group also left at different times in history just as they had gone to Afghanistan at different times in history. Some left as the Soviet war and its incessant bombing destroyed the lives of many. Even as ethnic Afghans joined the war these groups came to India or other countries where relatives had already settled. Again like most Afghans they too had hoped for this displacement to be temporary. But the short return to their homes was as traumatic, their homes occupied by warlords, their businesses destroyed. The relative prosperity of this group, once, can be gauged from the fact that despite being barely two percent of the population in Jalalabad, they controlled a large part of the economy. Over time they even enjoyed a reasonable level of religious freedom. The Afghan Hindus and Sikhs were an over 50,000 strong community before 1992 in areas like Ghazni, Jalalabad, Kandahar, Khost, Kabul and Laghman. Today there are about 1,500 Sikhs mostly living in Kabul. The ones who remained are either those who had no relatives abroad or lacked resources to migrate. Post-2001, many had sought refuge in India after clashes with some hostile local communities over cultural practices and rituals. The attempt to cremate a body in 2007 in Kabul had led to tensions between the Sikhs and sections of the local community as it was seen as blasphemous ritual. Amidst the Afghan diaspora spread across the globe the Afghan Hindus and Sikhs are remembered fondly by many Afghans themselves displaced by conflict. In India it is this group of Afghan Hindus and Sikhs that constitute nearly 90 per cent of the Afghan diaspora unlike their more ethnically mixed composition elsewhere. However, many who moved to India have subsequently also returned, mostly without their women. They run small businesses to support themselves and their families. These are men – fathers and brothers – who conduct trade between Afghanistan, Pakistan and India where their daughters (or sisters) have been married to local Sikh families in India. With their homes lost to the violence it is the local gurudwaras in Kabul that provide them shelter. And yet for this community their identity as Afghan Sikhs remains an emotive one. A meeting with an Afghan Sikh in Germany quite poignantly reflects upon their sense of exclusion and statelessness – “In the entire world we don’t even have an inch of space that we can claim as ours…we have been abandoned by both India and Afghanistan,” he said. The beheading of two Sikhs by the Tehrik-e-Taliban, Pakistan (TTP) underscores the heightened vulnerability of religious minorities in areas where the Taliban are in control. There is much confusion over why the Sikhs were killed. While some allege that the TTP had demanded that they convert to Islam others maintain that the two were among four Sikhs who were kidnapped for ransom over a month ago. Apparently the deadline for ransom expired and two hostages were decapitated. While this is the first time that the Pakistan Taliban has beheaded members of the Sikh community, intimidation and violence targeting the community is not new. In May last year, for instance, the houses of around 35 Sikh families in the Orakazai Agency in Pakistan’s North West Frontier Province (NWFP) were burnt down and their belongings auctioned as they had not paid $2,00,000 in jaziya (tax imposed on non-Muslims) to the Taliban. Sikhs have lived in Afghanistan and Pakistan for centuries and have worked there as money changers, traders and businessmen. Ever since the eruption of the Afghan civil war, thousands of Sikhs fled to India. With a semblance of normalcy returning in 2004, some trickled back to Afghanistan. But with the situation in Afghanistan and particularly Pakistan’s NWFP and tribal areas deteriorating sharply over the last couple of years, a heightened sense of insecurity gripped the Sikh community there again. It is perhaps not their religious identity alone but their refusal to bow to the Taliban’s diktat that is the reason for their targeting. Muslims too are suffering grievously, as millions of them have been killed by the Taliban or subjected to flogging or summary executions. It is public reluctance to follow the puritanical way of life dictated by the Taliban or pay ransoms they demand that marks people out for Taliban punishment. This is a war between the Taliban and its opponents. As the war against the Taliban heats up, the militia can be expected to step up its brutal operations against ordinary people. As pressure on it mounts, it will increase its demands for money and allegiance from them. It is known to terrorise people into submission. Millions are fleeing the warzones along the Afghanistan-Pakistan border and the Sikhs could join their ranks. She wanted to be a pilot as a child, but has now been recognised as a leading campaigner for the rights of Afghan women. “It is difficult for a woman to be a pilot in Afghanistan. My father said it does not fit in with this country’s culture,” Dr Anarkali Kaur Honaryar tells me, sitting in her office at the Afghan Independent Human Rights Commission. In some ways the high flyer has taken on a challenge much tougher than piloting planes. Anarkali Kaur Honaryar says that Afghan culture "is loaded against women"
She fights for women’s rights in a society that remains staunchly patriarchal, and where many of her gender still breathe beneath their veils. In May 2009, the 25-year-old was chosen by Radio Free Europe’s Afghan chapter as their “Person of the Year”. The award has made her a household name in Kabul. Dr Honaryar – a trained dentist – is one of about 3,000 Sikhs and Hindus who remain in Afghanistan. Their number – and their prosperity – has significantly dwindled since 1991 when civil war broke out. Before then, there were an estimated 50,000 Sikhs and Hindus in this ethnically diverse country and many ran successful businesses in Kabul, Kandahar and other cities. But the outbreak of hostilities meant that most – including Dr Honaryar’s relatives – moved to safer places in India, Europe and Canada. She has led campaigns for the civil rights of the embattled communities who stayed on, including one to get crematoriums built for their dead. “Some people still think we are foreigners. They think we are Indians who are working and living here for a while. But we are Afghans too, and we should have all the rights and opportunities that other Afghans have,” says the demure yet outspoken doctor. She has grown up in turbulent times. In the early 1990s, Afghanistan was a country at war, with no stable central government. The provinces – including Dr Honaryar’s native Baghlan in the north – were ruled by warlords. To make matters worse, swathes of the country were falling into Taliban hands. Girls’ schools were banned in Taliban strongholds and religious minorities felt threatened by their extremist Sunni Muslim ideology – Dr Honaryar fell into both categories: a female and a non-Muslim. Fortunately for her, Baghlan did not come under Taliban rule. She carried on her education in relative freedom and graduated from high school four years ahead of her peers. “I am grateful to my parents for supporting my education. Not all Afghan girls have been so lucky,” she says. Once the Taliban were overthrown in 2001, Dr Honaryar went to Kabul University to study medicine. She was part of the loya jirga (grand council) that selected the interim government to replace the Taliban. “The situation for women has improved since the Taliban days. 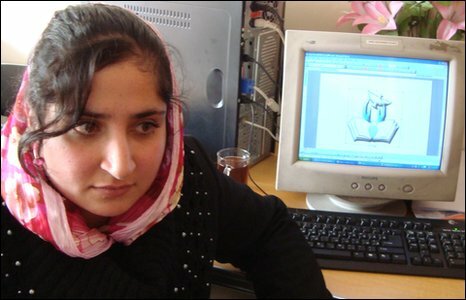 Now if the Karzai government does not listen to us, at least we can appeal to human rights groups,” she says. And so she joined the Afghan Independent Human Rights Commission in 2006. “They know I am a Sikh but they still trust me with their most personal problems,” she says of the hundreds of mostly Muslim women she meets. Awareness of existing laws is also at a premium here – the female literacy rate is less than 20%. Dr Honaryar recounts how an illiterate woman had travelled a long way to Kabul to meet her. The woman’s husband wanted to divorce her when she was expecting their child. “She didn’t know that Afghan laws state a husband cannot divorce his pregnant wife. He has to wait till the child is at least two months old. We helped her secure her rights,” she says, with a hint of pride. While conferences have taken her to different parts of the globe, Dr Honaryar regrets not travelling enough in the land of her ancestors – India. A visit to the Golden Temple in Amritsar – Sikhism’s holiest shrine – is top of her to-do list. And of course, the Taj Mahal.